Southern Rockies Nature Blog: Puccoon! This part of southern Colorado has enjoyed a wet spring--about seven inches of rain in a month--and all sorts of flora and fauna are popping up. I saw a wildflower today that I did not recognize--and I thought I knew what grows on our place. 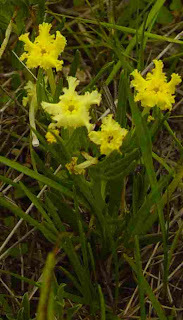 It is narrowleaf puccoon, Lithospermum incisum, with a trumpet-shaped flower whose large end is ornately frilled. Part of the borage family.